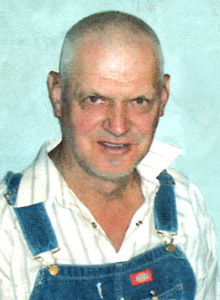 Services are scheduled for 10 a.m. Saturday, June 30, at the Pinon Baptist Church for Clarence “Buster” Stevenson. Stevenson passed away Sunday, June 24, 2018, not long after his 83rd birthday. Wayne Braziel and Dan Bell will officiate the services, with interment to follow at the Pinon Cemetery. Pallbearers will be Odie Prather, Mitch Hibbard, Nick Woods, Marshall Hiles, Gary Gage and Arden Lewis. Honorary pallbearers are Fred Gage, Bryan Prather, the Friday Morning Coffee Gang, and Doreen Teel. Visitation will be held from 10 a.m. – 8 p.m. Friday at Terpening & Son Mortuary. Buster was born May 18, 1935, in Carlsbad to Clarence and Willie Avery (Squaw Bill) Stevenson. Despite his handicap, he could do almost anything he set his mind to. He loved what he called “that good old country music,” meaning, we all think, only that written by Hank Williams. To be sure no one forgot, he had it etched on his grave marker at the Pinon Cemetery. He will be greatly missed. The Pinon community has lost an icon. Anyone who has ever lived in Pinon knows Buster, and most folks passing through do, also. He loved hunting season, as he fixed a lot of flat tires and exchanged pleasantries and tall tales with the hunters. He took care of the Club House, Pinon’s community center, and saw that all was well there and that the air conditioning was turned on before an event in the summer or heat turned on in the winter, and he was always present and had the coffee ready on Friday mornings for those who had time and wanted to meet for a morning coffee hour. Survivors include sister-in-law Mary Lou Stevenson and her family of Artesia; first cousins Glenna Bertola and her family, Dan Gage of Roswell, and Betty Jo Bratcher; a vast array of cousins, nieces and nephews, including Patti Woods Netzer, Bobby Stevenson, Cary Stevenson Pettit, Jacque Stevenson Hooten, LaNette Stevenson, Nick Woods, and their children and their children; and a community that looked after him as he looked after them. He was preceded in death by his parents; brother Robert; sister Billie Jean Woods; and lifelong friends and quasi-caretakers Samme and David Monson, who were across-the-road neighbors and kept a careful eye on him at all times. Samme and he had been raised in the houses they were born into, there on the corner in Pinon.